The GWSR initially restored and reopened around 14 miles (23 km) of track, operating between Cheltenham Racecourse and Broadway. The company had raised £1.38 million to extend northwards to Broadway, and completed the project in 2017–18 (see below). In the foreseeable future, the GWSR will eventually begin working on plans to extend a further 6 miles (9.7 km) to Honeybourne (where one half of an island platform has since been partly rebuilt for future usage). In mid 2018, the railway was offering a round trip of 28 miles on steam and heritage diesel trains between Cheltenham Racecourse and Broadway; it was using part of the route of the former Great Western main line from Birmingham to Cheltenham. The line was originally part of the Great Western Railway's Cheltenham–Stratford-upon-Avon–Birmingham line, known as the Honeybourne Line, built in 1900–1906, and runs through the Cotswold towns of Winchcombe and Bishop's Cleeve. The line was run down over the years and finally closed after a derailment damaged a stretch of track in 1976, with the double track being lifted from 1979. The preservation group rehabilitated the line, starting steam train operations at Toddington in 1984 over 700 yards (640 m) of re-laid track. In 1987 the line was restored as far as Winchcombe where the station was reconstructed using the former Monmouth Troy station building. The railway continued to re-lay track west of Winchcombe, through the 693-yard (634 m) long Greet Tunnel, and past the villages of Gretton, Gotherington and Bishops Cleeve. The line to Cheltenham Racecourse was re-opened by Princess Anne in 2003. The latest extension of the line, to Broadway, opened in March 2018. The GWSR runs trains from March to the end of December, with the line closing during January and February as well as November for line and locomotive maintenance. The GWSR runs regular train services every weekend plus most weekdays from Easter to the end of October, and some weekends are used to host special events including steam and diesel galas, Wartime in the Cotswolds, Easter Eggspress and Santa Specials. The railway operates a wide variety of both steam and heritage diesel locomotives, as well as heritage DMUs. These have included the world-famous locomotive 4472 "Flying Scotsman" and equally famous 3440 "City of Truro", which in 1904 was the first engine to reach 100 mph. In 2016 the resident steam locomotives on the line were 7820 "Dinmore Manor", 28xx class 2807, 42xx class 4270, 7903 "Foremarke Hall" and 35006 "Peninsular & Oriental SN Co". To complement the running stock a collection of over 210 carriages and wagons of various origins has been compiled, many of which are still being restored. The GWsR opened its extension to Broadway, Worcestershire to the public on 30th March 2018. The route consists of single line sections with passing places at the major stations. All stations and loops are signalled using GWR Lower Quadrant Semaphore Signals. Encouraged by support from Cheltenham Borough Council, who have given both the railway direct funds as well as placing protected status on the former lines trackbed south from Cheltenham Racecourse to Cheltenham Spa, the railway could at some point connect to Network Rail in the south. Although the GWSR have extended track to (and through) Hunting Butts tunnel, a few hundred yards beyond Cheltenham racecourse station, it owns the trackbed as far as the Prince of Wales stadium at Wyman's Brook. It is likely that after completion of its extension to Broadway, laying track further into Cheltenham will happen to this point; a distance of about 1 mile. However, beyond here major and costly engineering works would be required to extend the trackbed further south. The primary impediments are a bowstring bridge (located at 51°54′09″N 2°05′11″W﻿ / ﻿51.90245°N 2.086434°W﻿ / 51.90245; -2.086434), built in 2002 to allow continued access by bicycle along the old track bed alignment to Cheltenham Leisure Centre when planning permission was given for the redevelopment of the former Cheltenham Spa St. James station site as a Waitrose supermarket in 2002; the resulting bowstring bridge follows a section of former railway embankment, which was removed to provide road access to the new store. and the reduced height pedestrian specification bridge carrying the footpath -- rail bed beneath the very busy St Georges Road, which would have to be replaced - at great inconvenience to road traffic - to allow trains to pass beneath the road. There is land space beside the bowstring bridge to allow a railway to be built beside it, but there is no way of avoiding the work necessary to reinstate the road bridge beneath busy St Georges Road. When the GWSR was first formed, it intended to purchase the entire line from Cheltenham Racecourse to Stratford Racecourse. However, when applying for the required Light Railway Order, the group was informed that they were unlikely to be granted the order for 25 miles when they had no experience of running a railway. A reduced application for the 15 miles from Cheltenham Racecourse to Broadway was submitted. [clarification needed] Since this time, the section between Stratford and Stratford Racecourse has been utilised to improve road access around the town, especially the A4390, making reinstatement of rail to the main station at Stratford extremely difficult. In the early 2010s the GWSR was affected by two major landslips in embankments on the line, which severed the preserved line into separate sections; however, both slips have now been repaired, and the whole line has been fully reopened. In April 2010 the GWSR suffered a landslip of an embankment near Gotherington. Train services continued despite the Gotherington landslip, but over a reduced route. The landslip forced the closure of the line south of Gotherington, including Cheltenham Racecourse Station, which was effectively cut off. 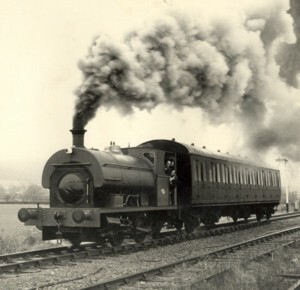 The railway continued to operate services from Toddington to Gotherington, with a locomotive at both ends of the train ("top and tailed"), as it was not possible to run the locomotive around the train at Gotherington at the time (there is now a run round loop just south of Gotherington). The railway launched a £1m appeal, both to fund the rebuilding of the embankment, and also to undertake preventative maintenance to ensure that similar problems do not happen at other points along the line. It was deemed unlikely that the line south of Gotherington would reopen before July 2011, but donations ensured that the work could be carried out promptly, and it was reopened on 22 April 2011. In January 2011 the railway was damaged by another landslip just east of Winchcombe station at Chicken Curve. The landslip severed the railway in two; it was very similar to the one at Gotherington, but closer to the middle of the route. It was estimated that the cost of the repair work would be £850,000; funds for the repair were successfully raised. During the repair period a DMU service was run from Toddington up to the extension at Laverton; since the earlier Gotherington slip had been repaired, steam trains ran from Winchcombe to Cheltenham Racecourse, the steam locomotive maintenance facilities temporarily being transferred to Winchcombe. The Chicken Curve landslip was repaired over the summer of 2012, and the GWSR was once again operational as a single unified line from Cheltenham Racecourse to the site of Laverton Halt, a total of 12 route miles in length at that time. Operational coaches are shown in bold. Stratford on Avon and Broadway Railway – a now defunct group that had initially hoped to restore the railway between Stratford upon Avon and Broadway. ^ Mitchell, Vic; Smith, Keith. Stratford-upon-Avon to Cheltenham. Middleton Press. ISBN 978-1901706253. ^ "GWR - Gloucestershire's mainline heritage railway - Chronology". Gloucestershire Warwickshire Steam Railway plc. 2010. Archived from the original on 2 August 2013. Retrieved 24 February 2014. ^ "GWR - Gloucestershire's mainline heritage railway - 2018 Timetable". Gloucestershire Warwickshire Steam Railway plc. 2018. Archived from the original on 26 March 2016. Retrieved 30 March 2018. ^ "Broadway Railway Station | GWSR | Broadway | Toddington |". Steaming to Broadway. 19 March 2013. Retrieved 24 February 2014. ^ Bill (21 January 2014). "Steaming to Broadway! : The Broadway Signal Box". Steaming to Broadway. Retrieved 24 February 2014. ^ Johnston, Howard (1–14 May 2013). "Regional News". RAIL. No. 721. p. 24. ^ Scott Wilson Group. "Waitrose Development, Cheltenham". Archived from the original on 21 September 2008. Retrieved 9 March 2010. ^ Development Control Sub-Committee (8 July 1997). "Redevelopment of the St.James site, Cheltenham". Gloucestershire County Council. Retrieved 9 March 2010. ^ "GWR - Gloucestershire's mainline heritage railway - Honeybourne Line train services continue despite Gotherington landslip". Gloucestershire Warwickshire Steam Railway plc. 23 April 2010. Archived from the original on 2 July 2014. Retrieved 24 February 2014. ^ gboydhope. "Churchward County Trust". Churchward County Trust. Retrieved 4 April 2019. New bridge on the Honeybourne Line. Wikimedia Commons has media related to Gloucestershire Warwickshire Railway.